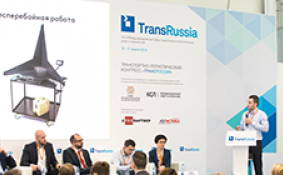 In 2019, the majority of Russian companies will continue to focus on the optimization of logistics processes and costs, the implementation of an integrated supply chain management methodology. The MMLF-2019 program and the new issue of the LOGISTICS journal are devoted to solving these and other problems. We are happy to draw your attention to logistics technologies aimed at increasing the efficiency of the warehouse. For example, this is the OSR Shuttle Evo shuttle system from KNAPP, as well as the TORNADO elevator-type vertical storage machine manufactured at the plant of the CONSTRUCTOR group of companies. Both solutions allow to minimize the errors, and to increase the volume of operations performed in the warehouse without increasing the area and number of employees. One more approach to optimizing warehouse operations is the use of drones for inventory of warehouses. Details are in the article by Evgeny Grankin, director of LLC YuVL Robotics. Irina Dementieva, Director of Supply Management, Distribution and Logistics of the M.Video-Eldorado Group, shares practical experience how they improved the efficiency of logistics operations due to merging M.Video and Eldorado. Sergey Deles, Anna Sinitsyna consider the problems of consistency and clarity of management processes when setting goals and objectives, and also offer the CIDOR method as an alternative to the SMART management technology. We are sure that you will be interested in other materials of the issue, for example, the article by Konstantin Kholopov and Olga Sokolova on the current state and prospects for the development of the North-South international transport corridor; article by Andrey Zykov and Kirill Sobolev on the development of the institution of an authorized economic operator in the EAEU and others. Dear readers and participants of the MMLF-2019! We are waiting for your interesting topics and suggestions. We will be glad to work together and are confident that its results will effectively influence the development of logistics in Russia. We’ll be glad to meet you on the pages of the journal "LOGISTICS"!